China simply cannot rely on its SSBN force to act as a reliable second-strike deterrent against the United States. Not all ballistic missiles submarines are built equal, and neither is all maritime geography. In a recent article at the Bulletin for Atomic Scientists, Owen Cote examines the boomer balance between China and the United States in light of the long-running competition between the United States and the USSR during the Cold War. Cote suggests that for the foreseeable future the United States can rely on technological and geographic advantages that will keep its own deterrent secure, while putting China’s at risk. Cote offers a history of the undersea nuclear competition during the Cold War. The United States Navy, first to deploy operational SSBNs, soon became aware that its new submarines were detectable at long range with the appropriate passive sonar technology. Having ascertained the problem, the U.S. Navy first took steps to make its SSBNs quieter (and thus nearly immune to Soviet detection), and second expanded its listening capabilities such that it could more fully monitor Soviet SSBNs. In consequence of technology, and because of certain geographic advantages, U.S. boomers could hide effectively while Soviet boomers were under perpetual threat from U.S. Navy attack boats. The Soviets were aware of these problems, and did their best to resolve them. As is well-known, the Soviets eventually decided on a “bastion” strategy, using a large chunk of their fleet to protect SSBN patrol areas. As Cote points out, the Soviet solution to the problem was immensely costly in resources. The inability of Soviet boomers to reliably hide meant that the Soviet Navy needed to use substantial surface, air, and subsurface assets to keep the boomers protected. With respect to detecting NATO boats, the Soviets lacked the geographic reach to develop equally capable monitoring capabilities of their own. Fast forward to today, and the technological gap between U.S. and Chinese submarines is as large or larger than the gap between the U.S. and the USSR. More importantly, the United States has huge advantages in terms of its ability to monitor Chinese entry into the Pacific. Although the technical details are complex, Chinese submarines cannot reliably reach patrol areas in range of the larger part of the United States without being detected and tracked by the United States. Moreover, the U.S. likely has the political and diplomatic heft to maintain its access to the chokepoints that hem the PLAN in. Finally, and perhaps most importantly, China does not now and will not in the projectable future have a way of similarly monitoring the ingress and egress of U.S. subs. This leaves the Chinese in a position very similar to that of the Soviet Union, with perhaps an even greater degree of geographic constraint. China could adopt a bastion strategy, but as of yet there’s no indication that the PLAN wants to think of itself primarily as a defensive force. Indeed, its fleet construction does not suggest ASW as the dominant mission. And this means that for the foreseeable future, China simply cannot rely on its SSBN force to act as a reliable second-strike deterrent against the United States. To be sure, as Cote points out the SSBNs will remain an effective deterrent against India and other nuclear powers. But even if China extends the range of the missiles on its boats, it will still suffer severe disadvantages in terms of basing and patrol ranges. The U.S.SR could not dent the U.S. advantage, and it does not appear that China will be able to balance the equation, either. The move is likely to deepen the growing rift between Beijing and Seoul. 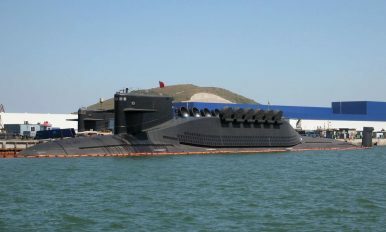 Could India's Arihant-class SSBN Lead to Strategic Instability in South Asia?China, the United States, and MIRVs: Challenges to Strategic Stability in AsiaThe Indian Ocean Won't Be a 'Nuclear Free Zone' Anytime SoonWhat Is THAAD, What Does It Do, and Why Is China Mad About It?Is China Considering a High-Risk Change to Its Nuclear Deterrence Posture?